Family, food , friends and gratitude. Thanksgiving is around the corner. The Holiday Season has begun. This time of year especially, is about celebrating all the good things in life and gathering with the people we love. Whether you are hosting Thanksgiving dinner, a Christmas Brunch, or a casual get-together take time to plan your table. A carefully curated table is as important as the food served. It engages the senses and sets the mood. When I am designing my table for a gathering I begin by thinking about two things. Nature and sentiment. Both of these are included in every table setting I create. Nature. Think beyond a fresh, floral arrangement. All elements of nature are beautiful. Besides inducing color, texture and form, nature brings in an organic element of liveliness, Pine cones and cedar branches can be scattered down the center of the table in place of a runner, Tuck in small candle votives or a string of tiny, white lights for a natural glow. Fill glass, mason jars with cranberries, walnuts or clementines for a more casual feel. Fasten small boxwood wreaths or a sprig of pine to the backs of chairs with a bow. 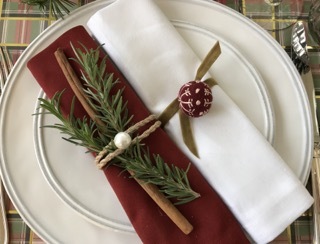 Cloth napkins tied with pretty ribbon or string and a sprig of rosemary, thyme and a cinnamon stick tucked inside creates both an elegant touch and a heartwarming scent. Mix it up. Adorn tiny, silver vases with small sprigs of holly at each place setting. Fill a small, mercury glass votive with mini pinecones for both a rustic and elegant placard holder. Take a walk outside or visit an outdoor nursery. See what presents itself! Sentiment.I always try to bring something to the table that is special from me to share with my guests. Is there a family heirloom that has been passed down? Perhaps a favorite crystal bowl or cake plate from a grandma that you can use as a base for a centerpiece? In the past I have stacked my favorite Christmas books underneath a centerpiece for added interest and sentiment. Do you have a favorite collection of your own to share that can be part of a centerpiece? Perhaps snow globes or snowmen? Tuck photos from past holidays in between branches of a garland and run it down the center of your table or place one at each setting for you guests to enjoy and pass around. How about leaving a special message or small gift for each guests? It can be characteristic to them or something general but meaningful for all from your family. One year I had my daughters (who were 4 and 6 at the time) draw pictures with a Happy New Year message and we made them into notepads, wrapped them with ribbon and put them at each setting for family members to take and enjoy throughout the coming year. Once you have these two things in place, the rest is easy. Add some color, texture and lighting. Candles, candles, candles. Mix in different types, votives,tapers, etc to create the effect you want. Have fun, look around, anything goes. Be whimsical and creative. A well-thought out table will create lasting memories for years to come.